PRICE IMPROVED FOR QUICK SALE! PERFECT HOME FOR A GROWING FAMILY!! 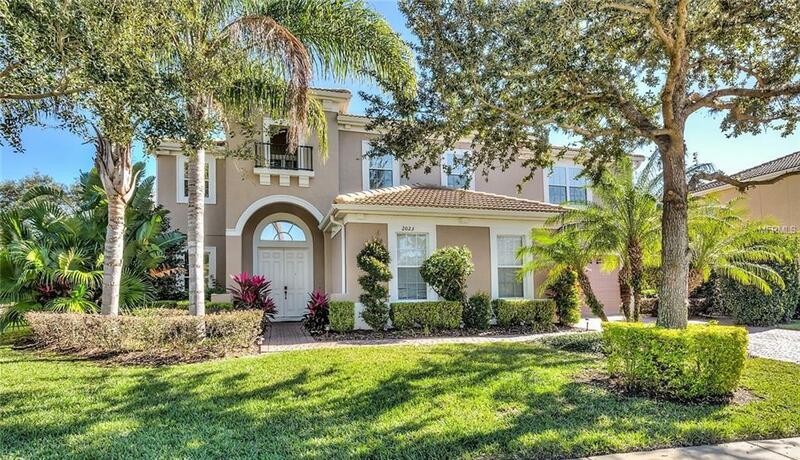 This spacious 5 bedroom/4 bath pool home in the highly desirable gated neighborhood of Bronson's Landing is located close to both the 429 and the Winter Garden Village. This home combines elegant living with peace of mind features certain to appeal to even the most discriminating of buyers. Situated on a gorgeous lot with a fence and privacy landscaping, the split plan home welcomes you with a large formal entry and features designer appointments throughout including tray and cathedral ceilings, designer window treatments, crown molding, custom built-ins, granite counters, and elegant touches. The private owner's retreat features an oversized bedroom with a tray ceiling and a sitting area, overlooking the pool, with his/hers closets, a spa-like master bathroom with travertine tiles and neutral stone accents. THE MASTER SUITE AND 3 GUEST BEDROOMS ARE LOCATED ON THE SECOND FLOOR. The fifth bedroom is located downstairs and has its own closet and private bath could be an in-law suite or a bonus room. The kitchen is a chef's paradise with upgraded custom cabinets, granite counters, a double oven and a walk-in pantry with ample storage. The spacious family room leads to the outdoor lanai and resort-style, Hawaiian lagoon SALT-WATER pool which provides the perfect family and entertaining area. The interior of the home has been recently painted a light neutral color after the pictures were taken. Welcome home! Listing provided courtesy of Lakeside Realty Windermere Inc.
© 2019 My Florida Regional Multiple Listing Service, Inc. All rights reserved. All listings displayed pursuant to IDX. All listing information is deemed reliable but not guaranteed and should be independently verified through personal inspection by appropriate professionals. Listings displayed on this website may be subject to prior sale or removal from sale; availability of any listing should always be independently verified. Listing information is provided for consumers personal, non-commercial use, solely to identify potential properties for potential purchase; all other use is strictly prohibited and may violate relevant federal and state law. Data last updated 2019-04-22T19:40:54.787. Homepride Realty Services is Saint Cloud's most innovative real estate team.